Does USPS display the message “Pre-Shipment” on its tracking page? You don’t have to worry. Here you can learn why the message “pre-shipment info sent to USPS, USPS awaiting item” appears. 1 What does USPS Pre Shipment mean? 3 What to do if see the message ‘USPS pre-shipment’ for more than 2 days? 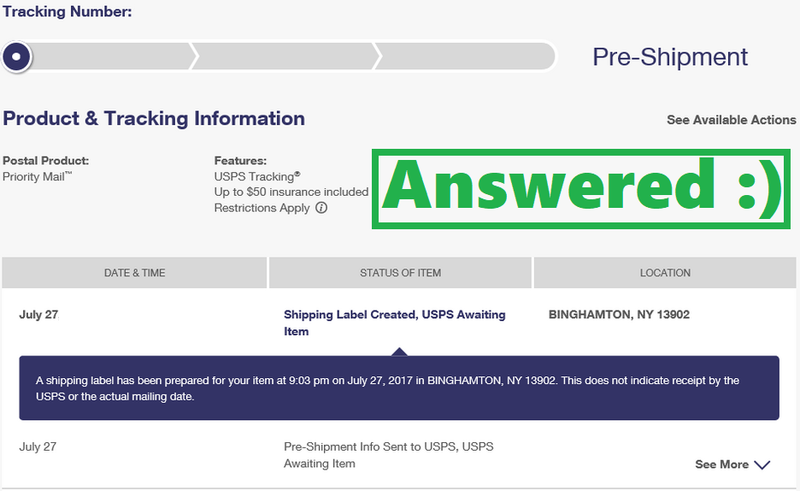 What does USPS Pre Shipment mean? The U.S Postal Service was electronically notified by the shipper to expect your package for mailing. This does not indicate receipt by the USPS (or) the actual mailing date. Delivery status information will be provided if / when available. Your package is on its way to a USPS facility. The shipping label has been prepared for your item. This means that your package is at the beginning of its journey. The shipper (the person who sent the item to you) has printed out a shipping label on the USPS website. But the USPS has not yet received the item from the shipper. So, the item will be shipped to you when USPS receives the item from the shipper. From this message, you can understand that your item will be shipped by the USPS and the tracking number works fine. Apart from the above reason, there are also other scenarios which trigger this message. Most common scenario: The item could still be in the seller’s / shipper’s possession. (Not with the USPS yet). There might be some deny in scanning the parcels during the holiday season. The item could have been sorted and sent off by the USPS without proper scanning. So, your package may be on its way. Rare scenario: The package is lost, broken (or) stolen. What to do if see the message ‘USPS pre-shipment’ for more than 2 days? Sometimes, you might see ‘USPS pre-shipment’ for more than 5 days (or) even 7 days. If you are in this situation then you must call the shipper and ask whether he had handled the package over to USPS or not. and ask them where is your package and why there are no updates on the status of the shipment. If you are seeing this message and if it is not more than 2 days then, please wait for a few hours. The shipper will deliver your package to USPS and the USPS will send it to you. Once your package enters the USPS sorting system then you will get regular updates on the USPS tracking page. If you want to know more information about this topic then you can comment below. If this post is helpful then please share it with your friends.